(AR) is a technology that layers computer-generated enhancements atop an existing reality in order to make it more meaningful through the ability to interact with it. AR is developed into apps and used on mobile devices to blend digital components into the real world in such a way that they enhance one another, but can also be told apart easily. AR technology is quickly coming into the mainstream. It is used to display score overlays on telecasted sports games and pop out 3D emails, photos or text messages on mobile devices. Leaders of the tech industry are also using AR to do amazing and revolutionary things with holograms and motion activated commands. 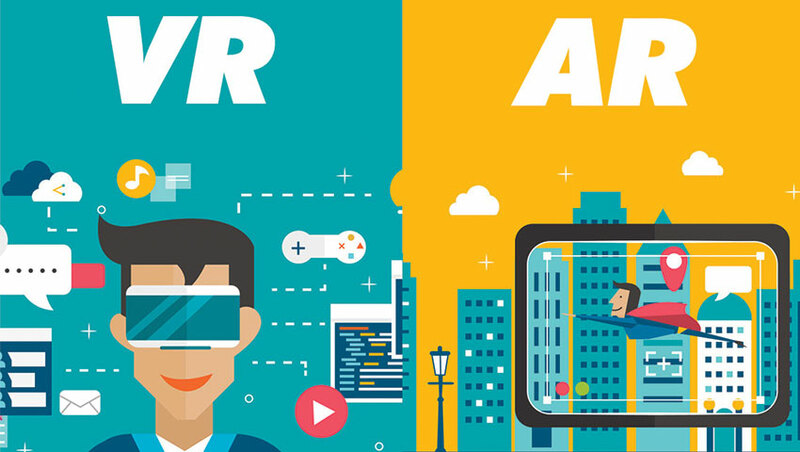 How are Virtual Reality and Augmented Reality Similar? Both technologies enable experiences that are becoming more commonly expected and sought after for entertainment purposes. While in the past they seemed merely a figment of a science fiction imagination, new artificial worlds come to life under the user’s control, and deeper layers of interaction with the real world are also achievable. Leading tech moguls are investing and developing new adaptations, improvements, and releasing more and more products and apps that support these technologies for the increasingly savvy users. Virtual Reality is usually delivered to the user through a head-mounted, or hand-held controller. This equipment connects people to the virtual reality, and allows them to control and navigate their actions in an environment meant to simulate the real world. Augmented reality is being used more and more in mobile devices such as laptops, smart phones, and tablets to change how the real world and digital images, graphics intersect and interact. It is not always virtual reality vs. augmented reality– they do not always operate independently of one another, and in fact are often blended together to generate an even more immersing experience. For example, haptic feedback-which is the vibration and sensation added to interaction with graphics-is considered an augmentation. However, it is commonly used within a virtual reality setting in order to make the experience more lifelike though touch. Virtual reality and augmented reality are great examples of experiences and interactions fueled by the desire to become immersed in a simulated land for entertainment and play, or to add a new dimension of interaction between digital devices and the real world. Alone or blended together, they are undoubtedly opening up worlds-both real and virtual alike.